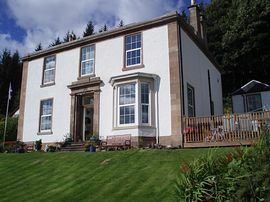 St Munns Old Manse is a handsome Victorian lochside villa with panoramic views over the Holy Loch to the hills and glens beyond. We are Angie and Mike Burke and have lived here for six years. We previously worked in the wine trade and brewing industry before returning to Mike's roots in Scotland. This is our fourth year as B&B proprietors. 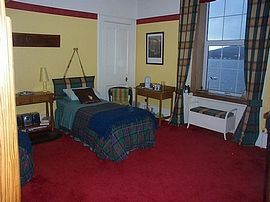 The large double and the large twin room both have panoramic views of the water and hills beyond from their windows. Each room is tastefully furnished in keeping with the age and style of the house. Both rooms are equipped with hospitality trays, wine glasses, television, music centre, cosy dressing gowns and comfortable seating. The guest fridge situated on the landing is well stocked with fresh milk, bottled water and nibbles plus a basket of herbal and flavoured teas on top. You are also welcome to use this facility to chill your own drinks. 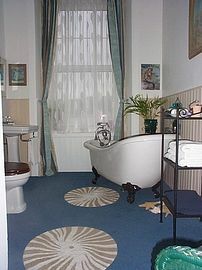 The grand Victorian style bathroom complete with walk in shower is shared by the two rooms and is full of toiletries and lotions for our guests to use. Enjoy a relaxing bath whilst you gaze out across the water of the Holy Loch. There is also an additional cloakroom across the landing. Breakfast is served in the splendid dinning room where guests can have the full three-course Scottish breakfast or choose something lighter from our breakfast menu. Why not begin with one of Angie's delicious fruit smoothies! Outside a lawned garden complete with midge-eater, fronts the house and a decked area provides a wonderful place to sit and partake of your favourite tipple whilst you look out over the water or enjoy one of Argyll's spectacular sunsets as the daylight disappears over Glen Massan. The house backs directly onto the forest and a network of forest roads awaits the more adventurous, through the garden gate. We encourage our guests to leave their cars behind and explore this beautiful area by walking from the Manse; we are always willing to point out our favourite walks. We can arrange to drop you off at the start, or pick you up at the end of your walk - just ask us. If walking is not for you then we can point out many lovely car routes that take in the very best of the Cowal peninsula's wonderful scenery. As we only provide two rooms for bed and breakfast we feel it enables us to give a very special and personal service to our guests. We hope you leave the Manse feeling that you have been in our home as house guests and not hotel guests. We love staying here, we think you will too. 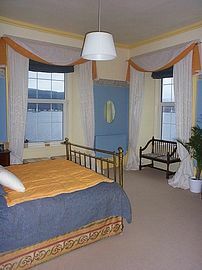 £25.00 per person per night bed and breakfast based on two people sharing room. Single occupancy £28.00 - £30.00 per person. Pet Facilities: Pets are allowed. By prior arrangment - two deerhounds already live here. Special Diets Provision: Special diets are catered for. Any dietary request catered for. Just let us know before you arrive. 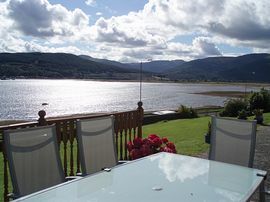 Kilmun is situated 6 miles north of Dunoon and is 1 hour from Glaswow airport via M8/A8 to Gourock (40 mins) then via Western ferries across Firth of Clyde (20 mins). Turn right out of ferry terminal and follow coast road around Holy Loch. Turn right for Kilmun and we are 1 mile along the shore road.